Isn't this simultaneously amazing and extremely creepy? Want more? Click here. Its almost 6 o' clock on a Saturday, [Tangent: The Billy Joel enthusiast inside me just sang "...the regular crowd shuffles in." Isn't Piano Man somehow applicable to all life processes? Drinking. Being alone. Singing. Joining the Navy. ] and I am beat. It's a gorgeous day. As I drive around Nashville with my windows down and AC blasting simultaneously, the streets are bustling with happy families on roller blades and packs of women power walking. [Tangent: Apparently I live inside a commercial for vitamins.] One would think witnessing all that activity would encourage me to go participate, but I am worn out from all my errands and goings on earlier in the day [Tangent: Plus...I've never been much of a power walker or roller blader. Weird, right?]. Add my full day to pricey gas, and, although it pains me, I feel an evening at home with cable television is in order. 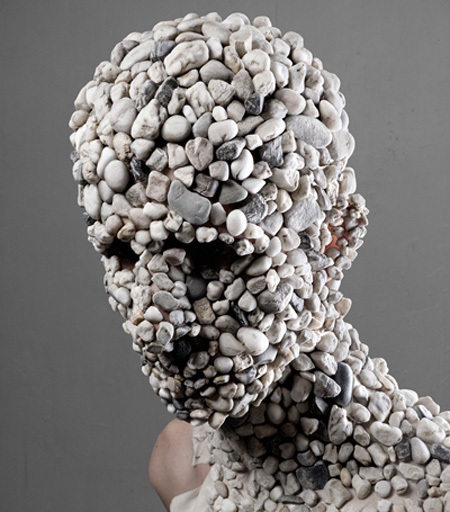 Because I have neglected my blog for a few days since my descent into the rabbithole of nostalgia (at least for people in the 25-35 demographic), I thought I would write today on something that really irks me: gravel. It's one of those fixtures of everyday life that grinds my gears like no one's business. This afternoon I was looking for a handicapped parking spot and where were they? On a gravel covered plain. Being that I have a strong background in building Lego cities, I understand commerce and construction. It's my guess that gravel is more cost effective then cement and seems easier to maintain. Instead of going to the trouble of repairing a pothole or uneven surface, someone could just throw some gravel on it instead. [Tangent: Doesn't that seem like lazy problem solving? It's kinda like if you need to wash your jeans, but instead of doing such, you just spray them with Febreeze. It takes care of it for the day, but doesn't really take away from the fact that your jeans still need laundering]. However, the decision to post multiple handicapped parking signs in a gravelly area seems like a cruel joke by a very sadistic developer. 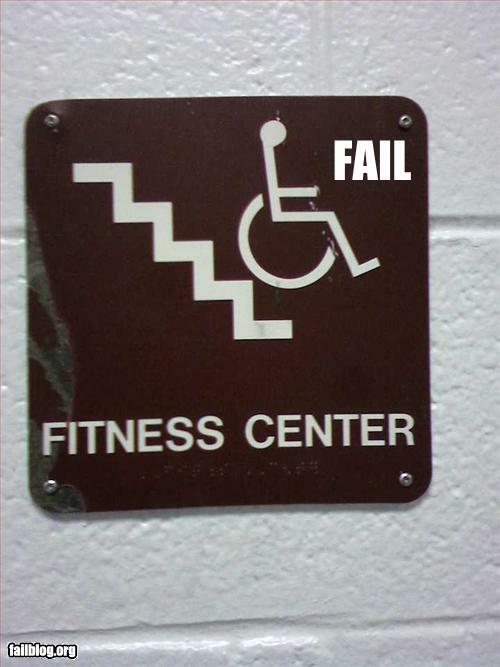 ...maybe not as bad as this...but still the result of poor decision making. 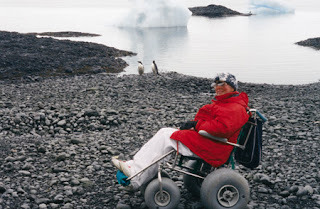 I'll admit, now that I am officially a motorized kinda gal, navigating on gravel is a lot smoother, but when I was in a manual wheelchair most of the time, it was a much rockier road. [Tangent: How many puns about gravel are possible in one sentence?] Imagine trying to push someone in a shopping cart with a wonky wheel or driving a car with flat tires through a tar pit, and then you will get an idea of what it's like. On a scale of 1-10, (One being hardwood floor and ten being quicksand), I will put gravel at a strong seven. A hug or 900 is likely deserved by mom and dad for always pushing me over the gravel, despite the fact that it was annoying and the cause of many an expletive. I am extremely surprised my parents never thought to invest in either of the following to keep on hand. Maybe if I had this, I could go see penguins like this lady! In all seriousness, I have used one of these on the beach and I have sworn that I will NEVER trespass over sand without one. 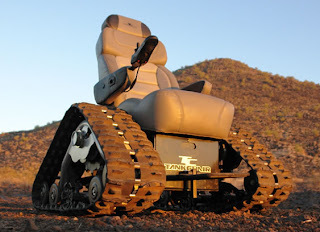 When I google image searched wheelchair over gravel, the image I got repeatedly was this sucker. It seems like it's missing a grenade launcher, and if I ever saw one on the streets, I think I would be unable to play it cool and not point out the obvious elephant in the room- that there are tank wheels on a wheelchair. Ok. Tirade over. Go about your lovely Saturday, and I hope, not unlike icicles, you will never look at gravel the same. Now, don't even get me started on cobblestone. oh, cobblestone. you look like you might be passable, but when i try to manually propel myself over you, i feel like i have been strapped to a jackhammer. you dirty, dirty tease.